The Ac1200 usb adapter that can pair with 11ac wave 2 MU-MiMo router. AP Mode （signal transmitter）：WINDOWS XP/VISTA/WIN7 8. Station Mode（signal Receiver）：WINDOWS XP/VISTA/WIN7 8 10/MAC 10.4-10.12. ※Ultra-Speed: Up to 1200Mbps Wi-Fi on 5GHz or 2.4GHz bands, download 1 Blu-Ray movie in 2 minutes, lag-free experience for streaming HD video and gaming. ※Large-Scope: Wireless LAN USB 3.0 Dongle,802.11ac Wi-Fi technology and detachable 5dBi omnidirectional dual band antenna for increased coverage and stability. 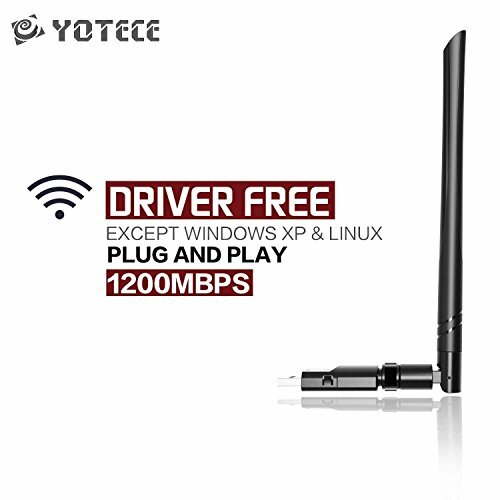 ※Broad compatible: YOTECE USB Wireless Network Adapter Support Windows 10/ 8.1/ 8/ 7/ Vista/ XP (driver needed), Mac OS X and Linux (driver needed). It is ideal for seamless HD streaming, gaming and other bandwidth-intensive tasks. ※Ease of use: Driver and Setup Free, auto install. Plug and Play on any device with USB-A port. Once you plug the adaper, you are connecting to the world. ※Lifetime Warranty: Replace and Refund Anytime Anywhere. If you have any questions about this product by YOTECE, contact us by completing and submitting the form below. If you are looking for a specif part number, please include it with your message.